Why is it so hard to wake up on a Monday? Like, listen up here BODY, I rested you all weekend long (minus the late night dinner and movie with lots of cocktails on Friday and all day wine spree on Saturday, which are totally irrelevant to my argument), can't you just be ready to tackle the week head on?! Mondays are for the birds. I generally manage to muscle through Mondays by game planning fun things to do throughout the week, which [generally] [usually] [okay, always] pertain to food and [sometimes] [occasionally] [you got me again, always] drinks. 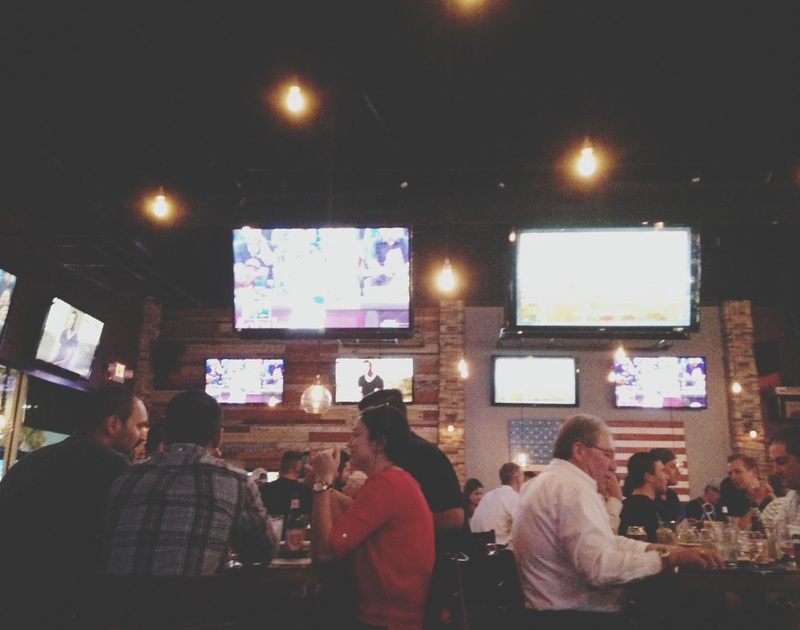 Last week, one of my many "foodventures" <~~(permission to punch me in the face granted) entailed joining a bunch of friends for drinks/food at Beer Market Co. to watch the final Astros/Royals playoff game. Before we get into the food, let me just take this moment to say how proud I am to be an Astros fan. This year's young team played with so much heart, did so much more awesome than anyone had predicted, and got so much further than they had in years (ten. ten years to be exact). As Jon put it, they could have lost the Wild Card game to the Yankees, and it still would have been a fantastic season. Furthermore, I swell with pride over the overwhelming positive sentiment reflected by Astros fans city-wide after their series loss to the Royals. It truly was a great season. Anyone who knows me is probably laughing right now because I am so not a sports fan. But I AM an Astros fan, so this was an exciting season for me! And secondly, after having lived in Queens for several years, I am also a Mets fan, so I'm excited to see how the postseason pans out for them! 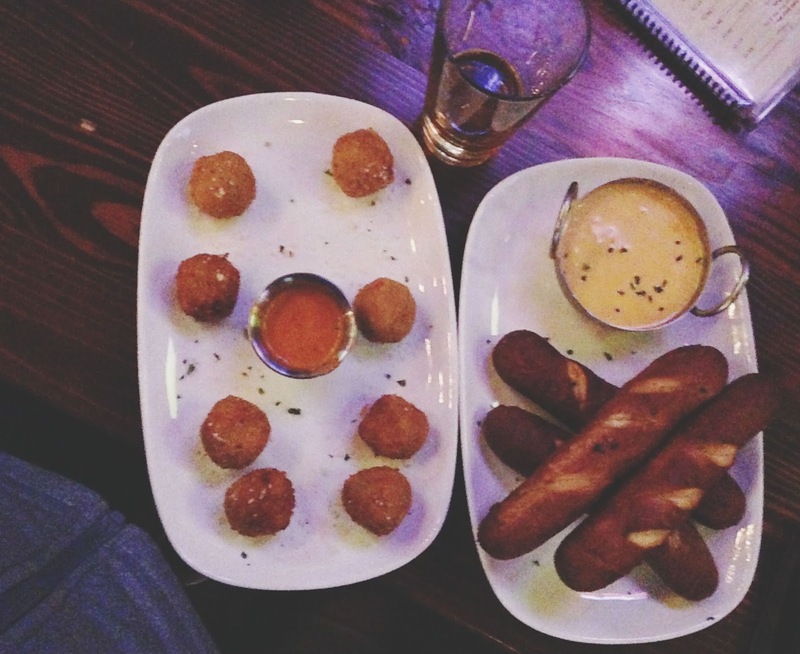 Jon and I split the fried mac 'n cheese balls and brew pretzels + real ale "hans pils" cheese dip to start. 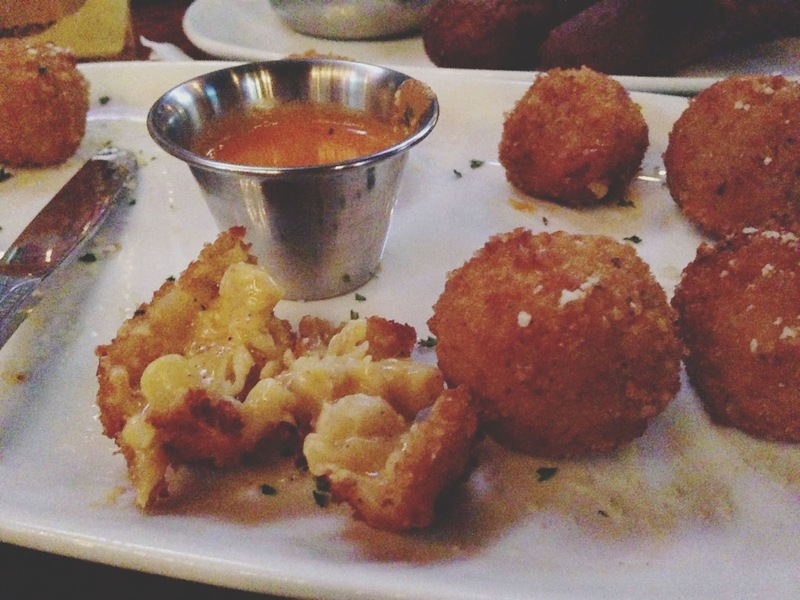 The fried mac 'n cheese balls was my absolute favorite dish of the evening. They were wonderfully crispy, and managed to stay crispy despite the creamy, oozing beautifully seasoned mac and cheese contained within. They were served with a spicy tomato sauce, which added a nice tartness to them, though they were wonderful on their own as well! I was pretty full after all of that, but I wanted to try one more thing, for the sake of research you know. So I ordered the veggie "workout" burger, which everyone found amusing since I had shown up to the bar in workout clothes, after having taken a yoga class. Of course I negated the whole "workout" aspect of the burger by adding cheese and a fried egg (well, the egg is healthy), and getting fries instead of a side salad. I thought the burger was just okay. The garbanzo and black bean patty tasted overly green, almost grassy to me. My friend Kate and Jon's friend Blake both really enjoyed it however. Blake said he'd eat that "stuff" (he didn't say stuff) all day long! Given that I am a vegetarian, I try a lot of veggie burgers at restaurants, which is why I'm so opinionated on the matter I suppose. But I did really enjoy their thinly cut, crispy fries. 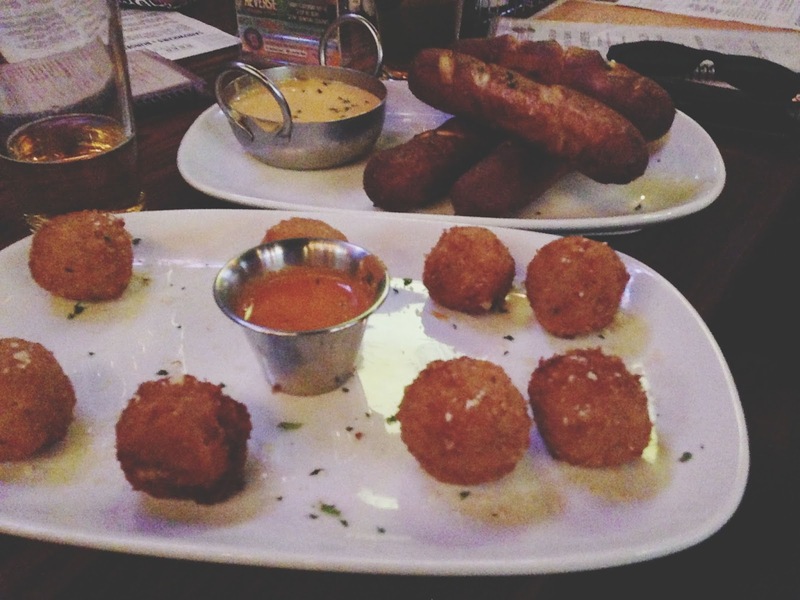 Overall, I for sure was a fan of Beer Market Co., and I definitely will go back. I've learned in Houston that if you're going to open a bar you cannot serve mediocre food. Joints like Local Pour, Little Woodrow's, and The Gorgeous Gael are just a few that I think set the bar pretty high with their food. 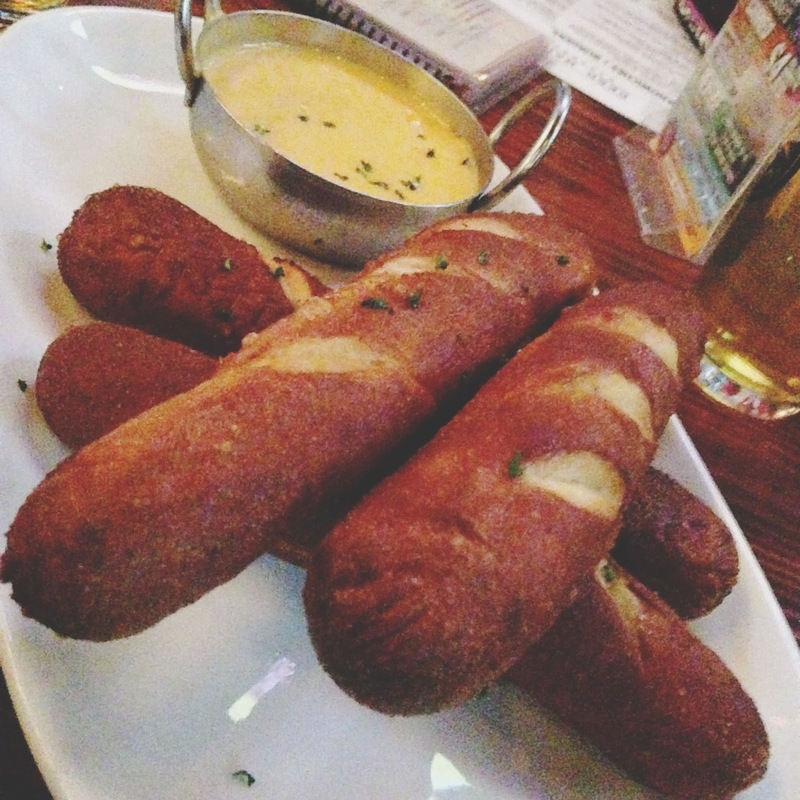 The appetizers I had at Beer Market Co. certainly meet that high standard. I also loved the sleek, open interior with tons of large screens everywhere. 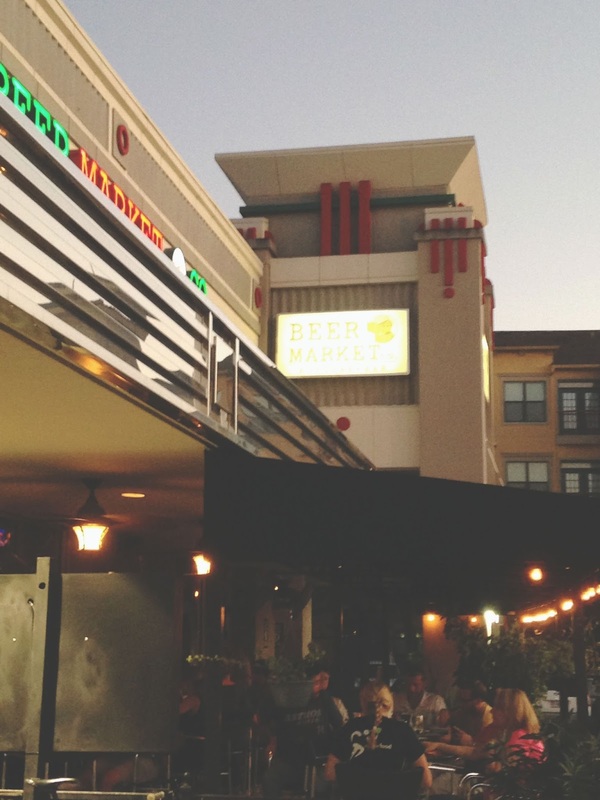 Beer Market Co. is a fun, welcoming spot that's definitely worth a visit! Go on, our Monday needs this. You cruel woman... I will be dreaming of cheese and carbs all week now! 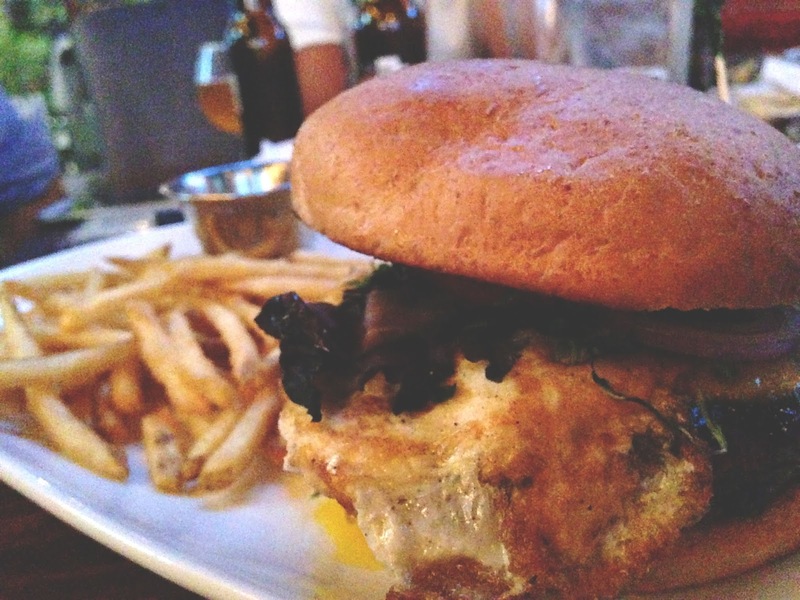 I totally agree, bars now need great food in order for me to stay there for longer than one drink. It's a good transition from the weekend to Monday, I swear. 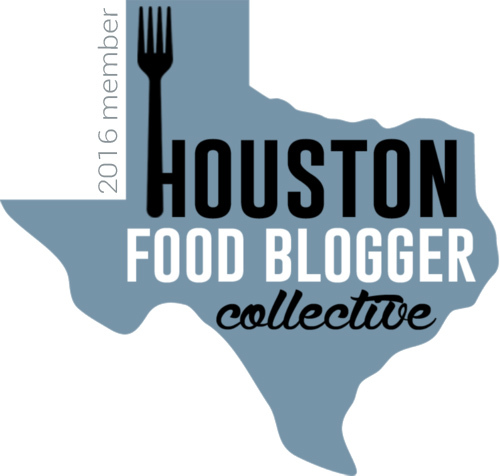 ;) Yep, the Houston food scene has gotten so great in recent years that even bars have had to rise to the challenge - And fortunately a lot of them (like Beer Market Co.) are!